2010: Best has gained 854 all-purpose yards (447 rushing, 407 receiving) and has scored 5 touchdowns (4 rushing, 1 receiving). With 5 touchdowns, Best is the first rookie in the league to score five touchdowns in his first two career games since Lions RB Billy Sims (4 rushing, 1 receiving). * In regular season opener at Chicago (9/12), carried the ball 14 times for 20 yards and 2 touchdowns for 7 and 4 yards respectively. Best also caught 5 passed for 16 yards. Best’s 2 rushing scores are the most by a Lions rookie running back in their first game since RB Billy Sims had three at the Los Angeles Rams September 7, 1980. Both Best and Sims performances occurred on opening day. * Best was the only rookie on opening day to record two rushing touchdowns. * Against Philadelphia (9/19) rushed for 78 yards and 2 touchdowns and caught 9 passes for 154 yards and a touchdown. 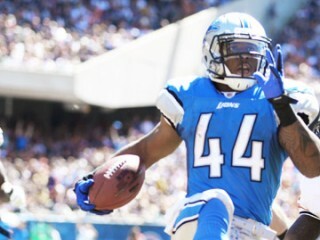 Best is the first rookie in NFL history with at least 75 yards, 150 receiving yards and 3 touchdowns in a single game. He is also the first player to accomplish the feat since Buffalo RB Joe Cribbs vs. Cleveland 11/1/81 (85 rushing, 163 receiving). * Best’s 232 all-purpose yards and 3 touchdowns are the fifth-most single-game total yards from scrimmage since 1960 and his 232 yards are the most by a rookie since 1960. * With 154 receiving yards, Best has most receiving yards in a game by a rookie running back during the Super Bowl era and the most single-game receiving yards by a Lions rookie running back in team history. His 154 yards are the most since Dave Middleton recorded a team record 168 yards vs. Chicago (11/20/55). Best’s 9 receptions are the most by a rookie running back in team history. * Best’s 75-yard screen pass for a touchdown in the second quarter ties for the fourth longest reception by a Lions rookie since 1947. * Rushed 7 times for 26 yards and caught 2 catches for 13 yards at Minnesota (9/26) before having to leave the game with a toe injury. * Combined for 104 yards against St. Louis (10/10), including 67 rushing yards and 37 receiving yards. It was his second-highest tally of total yards from scrimmage on the season. Career high 18 rushing attempts. * Combined for 88 totally yards (48 rushing, 40 receiving) against the New York Jets (11/7). * Did not play against New England (11/25). * Carried for 65-yards on nine carries, along with a career-high 45 yard rush against Chicago (12/5). Added one catch for 32-yards. Best started 18-of-31 games at California, carrying the ball 364 times for 2,668 yards (7.33 yards per carry) and 29 touchdowns. Also caught 62 passes for 533 yards (8.60 yards per catch) and six scores. As a return specialist, Best had 32 kickoff returns for 844 yards (26.38 avg). Gained 4,045 all-purpose yards, an average of 130.48 yards per game. His 2,668 yards rushing rank seventh in school history behind Russell White (3,367, 1990- 92), Marshawn Lynch (3,230, 2004-06), Justin Forsett (3,220, 2004-07), Joe Igber (3,124, 1999-02), Chuck Muncie (3,052, 1973-75), and Paul Jones (2,930, 1975, 77-79). His 1,580 yards on the ground in 2008 rank second on Cal’s season-record chart, topped by J.J. Arrington (2,018 in 2004). * His 311 rushing yards vs. Washington in 2008 set a new school record, topping the previous mark of 283 yards by Jerry Drew vs. Oregon State in 1954. His 311 yards also rank fourth in Pac-10 Conference history. * Best’s 29 touchdown runs tied Marshawn Lynch (2004-06) for third on the school’s career-record list, behind Russell White (35, 1990-92) and Chuck Muncie (32, 1973-75). * His fifteen touchdowns on the ground in 2008 tied the school season-record he shares with J.J. Arrington (2004) and Justin Forsett (2007). * His twelve touchdown runs in 2009 tied Jim Monachino (1949) for eighth on Cal’s annual record list. * Ranks sixth in school annals with 13 100-yard rushing performances. His average of 8.14 yards per rushing attempt shattered the old school season-record. Best’s 4,045 all-purpose yards ranks fifth in school history behind Deltha O’Neal (4,998, 1996-99), Russell White (4,943, 1990-92), Marshawn Lynch (4,574, 2004-06), Chuck Muncie (4,194, 1973-75). * His 2,247 all purpose yards in 2008 set a new school record…His career average of 26.38 yards per kickoff return topped the previous Cal all-time record of 25.3 yards per return by Isaac Curtis (1970-71). 2009: Honored by the College Football Performance Awards organization with the 2009 Elite Running Back Trophy. The award recognized Best as the top performer at the running back position based upon the 21 games in which he participated over the past two seasons. All-Pac-10Conference second-team selection by the league’s coaches and The NFL Draft Report. Named to the Watch Lists for the Doak Walker Award (top running back), Maxwell Award (player of the year), College Football Performance Awards Overall Performer of the Year and Running Back of the Year, and the Walter Camp Award (player of the year). One of the top Heisman Trophy candidates entering the year according to Lindy’s, Phil Steele, NationalChamps.net, and Sports Network. Co-recipient of team’s Bear Backers Offensive MVP Award. * Missed spring camp while recovering from left big toe and left elbow surgery performed in January. * Started 8-of-9 games before being injured, carrying 141 times for 867 yards (6.15 ypc) and twelve touchdowns. His twelve scoring runs tied Jim Monachino (1949) for eighth on the school’s season-record list. * Produced 36 first down runs on 141 attempts (25.53%),as he converted 3-of-11 third-down rushing attempts (27.27%). * Had 22 carries for at least ten yards (15.60%), including 12 for 20 yards or longer (8.51). * Produced fifteen positive runs inside the red zone, including twelve on goal line plays. * Tackled for a loss twenty times and stopped for no gain on ten other carries. Had key rushed that set up sixteen touchdown drives. * Caught 22 passes for 213 yards (9.68 ypc) and four touchdowns, adding 18 yards on one kickoff return. Seven of his 22 receptions (31.81%) produced first downs, including converting 2-of-6 third-down passes. * Had eight receptions of at least ten yards, including three that went for 20 or more yards. * Pulled down 22-of-33 passes thrown to him (66.67%)…Earned Pac-10 Offensive Player of the Week honors vs. Minnesota and College Football Performance. * Awarded Running Back of the Week honors vs. Maryland, Eastern Washington and Minnesota. 2008: All-American second-team selection by The NFL Draft Report and College Football News. First-team All-Pac-10 Conference choice for the second straight year (special teams in 2007), as well as sharing the Bear Backers Award, given to the Team MVP, with seniors Zack Follett and Alex Mack, while taking home the team's Most Valuable Back honor. Led the Pac-10 and ranked third in the country in rushing, averaging 131.67 yards per game, as he finished with 1,580 and fifteen touchdowns on 194 carries (8.14 yards per carry). His rushing yards were the second-highest ever at Cal, behind only J.J. Arrington's 2,018 yards in 2004. His 8.14 yards per carry was the best of any player in the Football Bowl Subdivision (FBS) with at least 125 rushes in 2008, as well as a school season-record. * Led the league and ranked second in the nation with 187.25 all-purpose yards per game. * Led the Pac-10 in kick return average (26.31), as he gained 421 yards on 16 attempts. * Tied for the league lead in scoring with an average of 8.0 points per game. * Became the first non-quarterback to pace Cal in total offense (eighth in the Pac-10) since Gary Fowler co-led the team in 1969, and the first running back to lead by himself since John Olszewski in 1952. * Ran for over 100 yards in eight contests. 2007: Selected as the team's Most Valuable Freshman as well as Cal’s J. Scott Duncan Award (Most Valuable Special Teams Player). Earned All-Pac 10 Conference first-team honors as a special team performer. As a true freshman, Best was the primary backup to Justin Forsett. On only 29 carries, he totaled 221 yards (7.62 ypc) and two touchdowns, adding 74 yards and a score on thirteen receptions (5.69 yards per catch). Returned fifteen kickoffs for 405 yards (27.0 avg). * Serving as the gunner on the special team units, he registered twelve tackles (8 solos) with a fumble recovery. * Gained 700 all-purpose yards, an average of 70.0 yards per game. * Missed the final three games of the season vs. Washington, Stanford and Air Force due to a hip injury. * Tallied 20 or more yards on 28.0% of his touches (16-of-57 plays). Attended Salesian High School (Richmond, California). Earned Super Prep and Parade All-American honors as a senior. The consensus Bay Area Offensive Player of the Year rushed for 3,325 yards and 48 touchdowns as senior, setting Bay Area prep season-records. The speedy tailback showed his big play ability early on, as 25 percent of his touchdowns as a senior were gains of 50 yards or longer. Was a "Best in the West" first-team choice by the Long Beach Press-Telegram, adding first-team All-State honors from CalHiSports.com that year. * As a junior, Best ran for 1,444 yards and added 271 yards in receptions with 20 total touchdowns, including ten carries for 50 yards or longer. * The tailback also excelled in track, winning a gold medal in the 200 meters at the 2005 USTAF Junior Olympics. * In 2007, he won a California State Championship in the 100 meter dash with a blazing time of 10.31, and finished second in the 200 meters with a time of 20.65. * General Studies major, with an emphasis towards Legal Studies. * Son of Lisa and David Best. * Full name is Jahvid Andre Best. * His name is a combination of Jah and the last syllable of his father's name, David. * Born January 30, 1989 and resides in Vallejo, California. View the full website biography of Jahvid Best.